All about the books, paper and electronic, that I am reading. I simply adored The Unexpected Inheritance of Inspector Chopra. The novel begins on the last day of work for Police Inspector Ashwin Chopra. He's retiring after nearly 30 years as a policeman in Mumbai. But Inspector Chopra has a hard time coping with retirement. First of all, there's the unsolved murder of a poor teenaged boy. Then there's the uncomfortable situation at home complicated by the baby elephant received from his uncle. So, like many retired policemen, Chopra can't just walk away. He keeps poking his nose into the investigation, discovering that higher-ups in the police department want the case closed quickly with a ruling of accidental death. But Chopra is convinced that the boy was murdered. And, back at home, the head of the residents' committee wants Chopra to get rid of the baby elephant and remove it from the yard surrounding the apartment building. 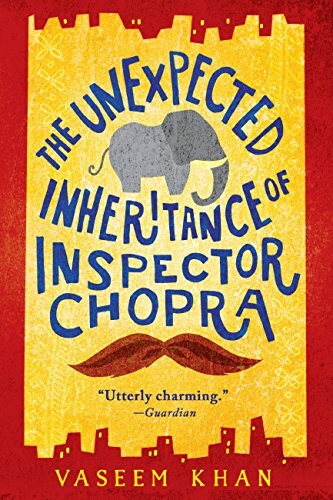 The Unexpected Inheritance of Inspector Chopra is a gentle and charming mystery. The setting in Mumbai is “exotic” to this Texan American who hasn't traveled too much outside the USA and is intrigued with the everyday life of people who live on the other side of the world. But, as different as India is compared to Texas, I could immediately identify with Inspector Chopra and his wife Poppy. Their concerns weren't different at all. Chopra has to deal with the domineering Mrs. Subramanium, chairman of the residents' committee. He's got the aggravation of his interfering mother-in-law living in his home. And the new Inspector is so jealous of Chopra that he won't listen to anything he has to say about the murdered boy. Mystery readers will adore the gentle yet persistent Chopra. Baby Ganesh, as the elephant is named, contributes his own charm to the story. All-in-all, a delightful read. I note that Vaseem Khan has another Inspector Chopra book due out in May of 2016—which I hope heralds a long series to come. Disclosure: I received a free copy of The Unexpected Inheritance of Inspector Chopra from the publisher via NetGalley in return for an honest review. I'm an avid and enthusiastic reader and my main weblog is to keep track of the books that I read. But there are so many other things that interest me, particularly paper arts such as collage, ATCs, decos, scrapbooking, and rubberstamping. I write about my hobbies at Pasticcio. By profession I'm an IT consultant, though I've found that my undergraduate degree in Elementary Education comes in handy from time to time in my consultations. I may receive free books—hard copy or electronic—from authors, publishers, NetGalley, and other sources. This will never affect or influence what I review or recommend or my opinions in any way. I will always state where I received each book I review. Statements and opinions expressed in reviews and posts on this blog are mine and mine alone. Opinions shared by others in comments may not reflect my own views. I reserve the right to moderate comments. Some links to Amazon are affiliate links benefiting an organization that I belong to. This means that if you make a purchase using any applicable links on my blog a small credit will flow to the BookObsessed online community. I receive no personal remuneration from these links.